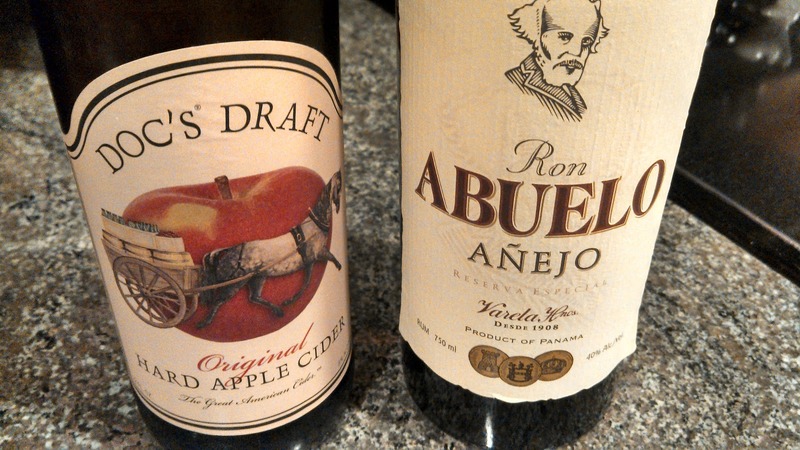 Hard Cider and Rum. Who knew that would be a viable mixture in a cocktail? Evidently Ernest Hemingway did - that's who. Garden & Gun Magazine just published a recipe named for close pal Joe “Josie Grunts” Russell - founder of the famed Sloppy Joe’s - that Hemingway scribbled down while fishing on Russell's boat in June 1933. You think they cared about Prohibition? The original cocktail most likely used rum from Cuba, whereas I substituted Ron Abuelo Anejo - a fine brand from Panama - made in the "aguardiente" style (pure cane juice). For the for cider I used Warwick Valley Winery & Distillery Doc's Draft Hard Cider, the 22 oz bottle fits neatly into the recipe. The result: the cider dominates from nose to tail; with the rum adding a little kick at the finish - but the tartness and acidity from the cider and lime smooth out the added alcohol.I know what I'm drinking all next summer. Cheers. Fill a pitcher with ice, add all ingredients, and stir well. Serve on ice in Collins or highball glasses, garnished with lime wedge or peel. Serves two to three. Update: A good friend notified me about a new book focusing on Hemingway's cocktail experience. Looking forward to reading To Have and Have Another: A Hemingway Cocktail Companion. In all the years I've lived or visited south Florida, I have always been disappointed in the deficiency of local beer options in the West Palm Beach area. That is, until now. 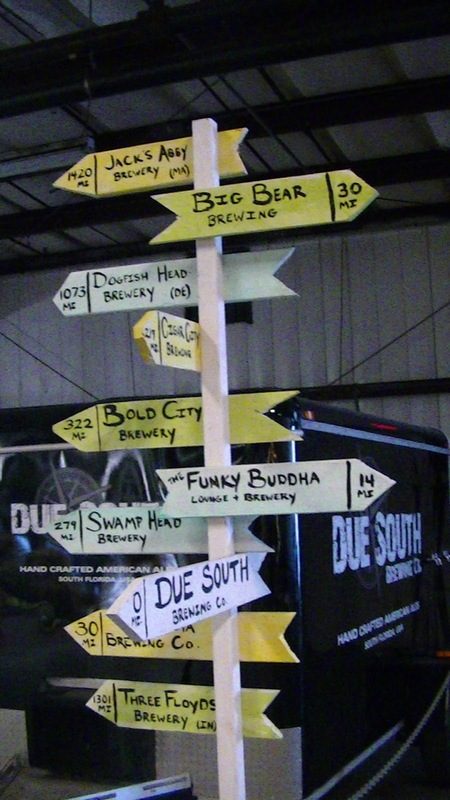 Earlier this year, Due South Brewing Company,opened their 15 BBL brewhouse in Boynton Beach - just off Route 95 and very close to our Florida destination. On Black Friday we visited during the brewery's all day Black Friday Party and tasted though most of their brews. And this is a wide ranging portfolio of low alcohol beers favored by owner and brewer Mike Halker. Starting with the Florida Blonde, which is an ale - and not the lager we presumed. It resembles an amber ale in color and flavor - but exudes much less hops at the tale. 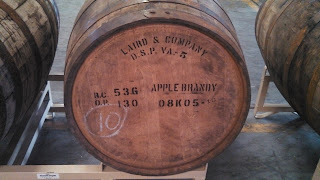 Next was the Caramel Cream Ale, aged in used apply brandy barrels from Laird & Company in North Garden Virginia. Nice. 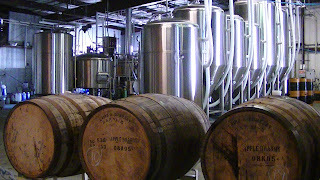 The beer is brewed with whole vanilla beans which gives it its creaminess as well as gentle sweetness. The seasonal Isle of MaGourdo is a "naturally conditioned pumpkin ale" that's right on - not overbearing - just subtle bits of pumpkin and spice. Just what we want for Thanksgiving. 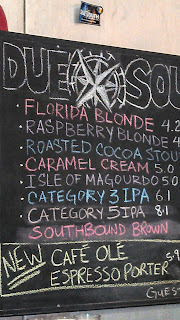 The specialty Southbound Brown was our first beer with a little more hops - 36 IBU. This is just enough malt to balance the roasted malt flavor. Another "roasty" flavor was the firkin delivered Roasted Cocoa Stout brewed with cocoa nibs - one of my favorites. 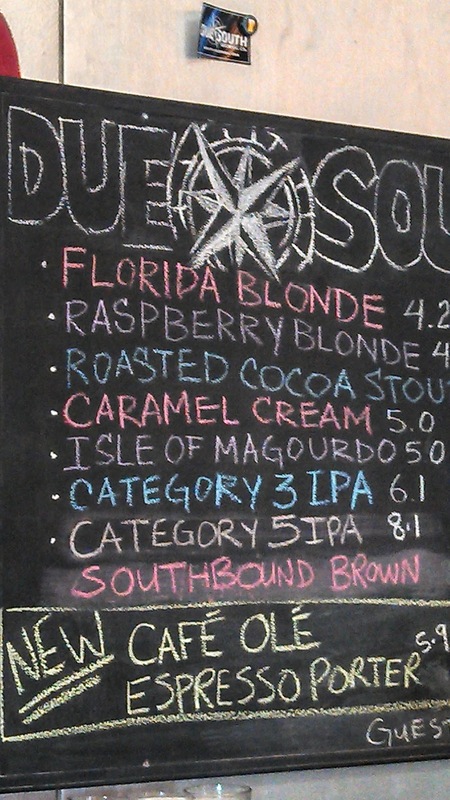 My other favorites were the Category 3 IPA (Cat 3) – Florida Style IPA and the Cafe Ole Espresso Porter. The Cat 3 is a clean refreshing India Pale Ale with a little citrus lemongrass and well balanced between the 64 IPU and malt. Next time I will try the even stronger Cat 4 at 85 IPU. And the porter, wow - whereas I enjoy my espresso in the morning, I normally do not care for espresso or coffee flavored beverages. Except for this one - perhaps a replacement for the morning ritual. The espresso flavors blends tightly into the chocolate flavors delivering a most pleasant tasting experience. In other words, this is one awesome ale. Nice job Due South - can't wait to return. Cheers to local beer. This week DrinkLocalWine officially announced the site for the 5th annual DrinkLocalWine Conference and the winner is a historic wine region as well as a rising player in the local wine industry: Maryland. I say historic, because Philip and Jocelyn Wagner, founder of Boordy Vineyards, were instrumental in the resuscitation of the East Coast wine industry by propagating French-American hybrids in their Maryland nursery. To learn more about this story we recommend Maryland Wine: A Full-Bodied History written by Regina McCarthy, former marketing coordinator for the Maryland Wineries Association. I mention rising wine industry because the Free State is currently home to over 50 wineries and cideries and about a dozen more in the pipeline. The state is also diverse in its topography from vineyards located in the sandy southern Maryland and the Eastern Shore to the rolling hills of the Catoctin & Linganore AVAs near Frederick, and the mountainous Cumberland Valley AVA to the extreme West. The conference takes place April 12-14th 2013 in Baltimore and count us in - get ready for some crab cakes and wine. Here is the official press release. 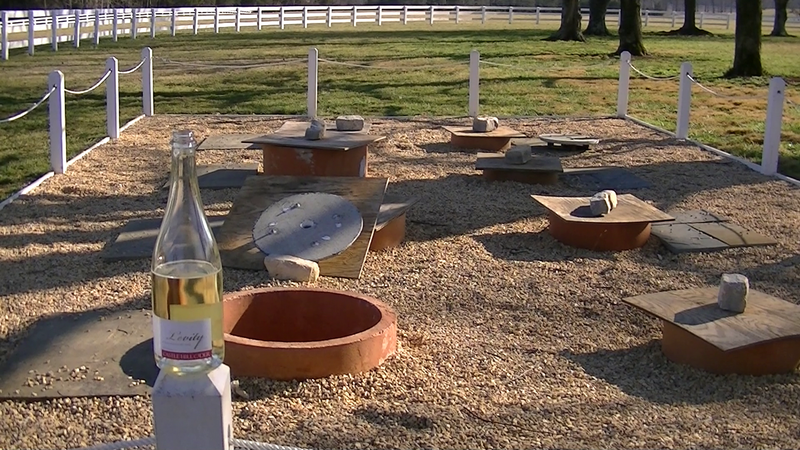 And below that are three videos we filmed at Maryland wineries. Cheers. Nov. 19, 2012 - DrinkLocalWine will hold its fifth annual conference April 12-14, 2013 in Baltimore, focusing on Maryland wine. The state's industry is one of the fastest growing in the country, nearly doubling in size over the past two years with more than 60 wineries. The state's four growing regions produce a variety of wines, including the classic European varietals, but also some that are distinctly New World in style. 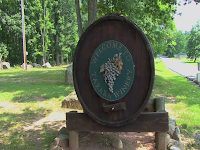 The Maryland Winery Association is the conference's primary sponsor. “We're growing a world of wine styles and varieties throughout Maryland, and we're excited to share them through DrinkLocalWine,” says Kevin Atticks, executive director of the Maryland Wine Association. 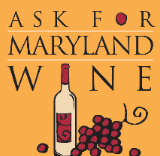 DLW 2013 will include a Maryland Twitter Taste-off featuring two dozen of the state’s best wineries, plus three seminars featuring some of the top names in Maryland and regional wine. Maryland's modern wine history dates to the 1970s, but grapes have been planted in the area since the 17th century. 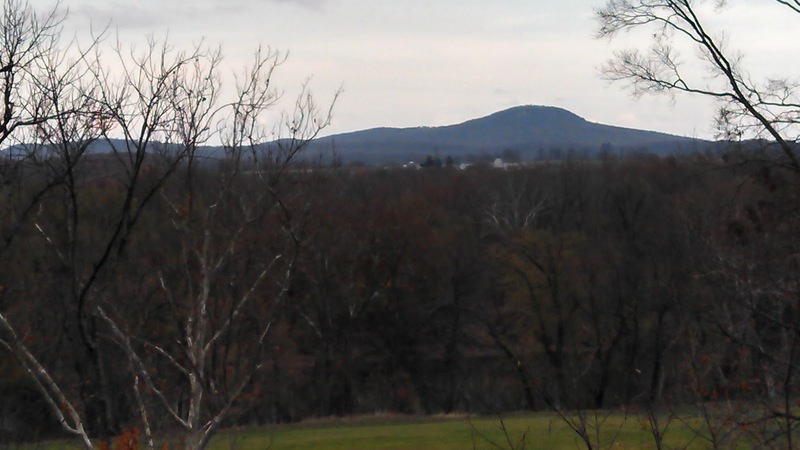 Most of the state's wineries are in the Piedmont Plateau in central Maryland, but grapes also thrive in the Eastern Shore, Southern Plain, and Western Mountains. DLW 2013 follows the success of the first four conferences - the inaugural conference in Dallas featuring Texas wine in 2009, in Loudoun County featuring Virginia wine in 2010, in St. Louis featuring Missouri wine in 2011, and in Denver featuring Colorado wine in 2012. DLW also holds an annual Regional Wine Week in the fall, in which more than 40 wine bloggers, writers and columnists from the U.S. and Canada write about their favorite regional wines, ranging from Ontario to New York to Florida to Texas to Colorado. For information, call (469) 554-9463 or email drinklocalwine@gmail.com. 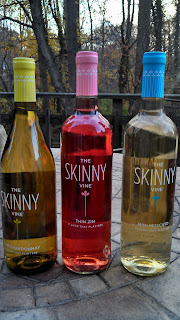 This week we were sent three samples of the new Skinny Vine wine brand for the monthly #TGTaste ThirstyGirl twitter tasting: Slim Chardonnay, Thin Zin and Mini Moscato. These wines are marketed as tasty, low calorie, low alcohol, and low cost ($11) wines for the youth wine market and competing against the highly successful FlipFlop wines. Many of my companions in the tasting loved the wines; but from what I sampled - don't waste your calories. Starting with the Chardonnay, it lacked any of the characteristic flavors associated with the grape, had a synthetic taste of vanilla and oak (staves or chips perhaps), and finished with zero acidity. My first impression was a flat wine cooler. Matters worsened rapidly when moving to the Thin Zin which is basically a rose colored white zinfandel. The wine started with a respectable strawberry nose which quickly evaporated when the sweet, syrupy "Kool-aid" entered the mouth. Our first thoughts, a wine for a 16yr old. Simply terrible. I had to temporarily grab a dark beer to cleanse the palette since my taste buds felt so tainted. We eventually moved on the Moscato, which actually wasn't that bad - easily the best of the trio. The three muscat grapes (Muscat of Alexandria, Muscat à Petits Grains and Orange Muscat) provide the aromatics you would expect; but the flavor is diminished by a syrupy composition and a lack of acidity at the tail. Other than that, it was drinkable. This week I had a little business to conduct at Tarara Vineyard & Winery and used the opportunity to catch up on their latest vintages. The last wine I had tasted was their very successful and highly acclaimed 2010 Honah Lee White which was awarded a Gold medal in the newly revamped 2012 Governor's Cup. And one of the reasons for my trip was to acquire more of this single vineyard blend. Unfortunately, I got sidetracked by their latest releases and totally forgot the purpose of my trip. During the tasting I sampled three whites, three reds, a dry rosé, and a dessert wine. With the exception of the Long Bomb Edition Three (as my mother-in-law says, I'm always "againsting" that wine), I enjoyed all the wines and they were very solid representations of the grape varieties. I started with the 2011 Viognier ($20), sourced from two Northern Virginia vineyards: Williams Gap and Maggie’s Vineyard. And I encourage readers to visit the Tarara website which provides excellent information about all the vineyards where they source fruit. This is a solid Viognier, more citrus and grassy than peach, with balanced acidity. 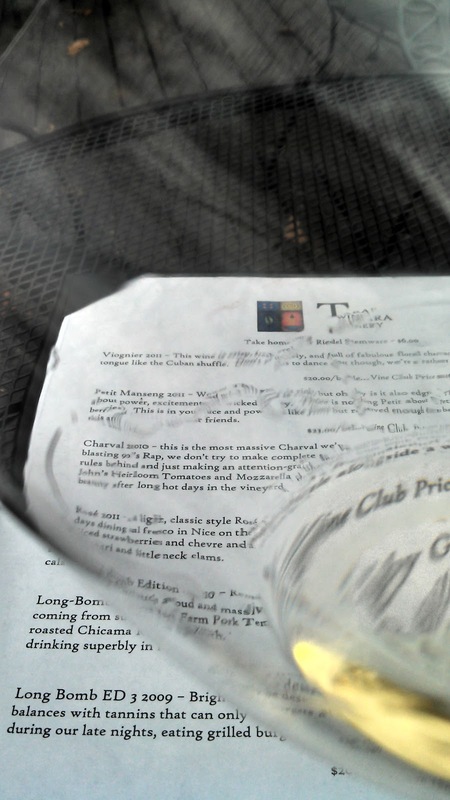 Next was the 2011 Petit Manseng ($23), one of my latest favored varieties, and at first I was stumped? Where was the sugar. The wine had pineapple flavors and the typical great acidity - but no sweetness. Then I learned the secret. This is a 100% dry Petit Manseng - very very little residual sugar with the bonus that it retains the flavor depth of a semi-dry or dessert wine. Nicely done. The final white was the 2010 Charval ($20.00) - and interesting blend of Chardonnay 65%, Sauvignon Blanc 14%, Petit Manseng 12%, Viognier 7% and Roussanne 2%. This is a crowd favorite; off-dry, easy drinking, fruity, and crisp acidity. What's not to like? You want a value wine? Then check out their 2011 Rosé, a kitchen sink blend dominated by Malbec, with Syrah, Pinotage, Merlot, and Cabernet Sauvignon. The wine is currently on sale for $10 and is a sold dry rosé - raspberry aromas lead to a light strawberry flavor. For that price and quality, I couldn't resist. Turning to reds, their 2010 Long-Bomb Edition Four ($20) completely makes up for my apathy to Edition Three. The wine is made from mostly Bordeaux grapes but resembles a Burgundian styled wine, strong dark cherry aroma and flavor with a slightly spicy finish - but complete silk in the mid-palette. The Pinot Noir dominates Bordeaux in this one. I was ready to run home with this one until I was told a secret - that is - given an opportunity to sample the 2010 #socialsecret. This is a limited edition wine marketed solely through social media. The wine is a blend of somewhat "secret" grape varieties: Tannat, Petite Verdot, and Pinotage that is silky smooth - with the profile and texture of a Rhône styled wine - and no smoke from the Pinotage. This is probably my favorite wine of Jordan's and I'm sure he and his staff had fun devising the final blend. The downside: $40 - on the very high end of our wine budget - but with the limited release I figured I could return another time for the LB4. The final wine was the Late Harvest Petit Manseng, at 6% RS, more of the style of wine I had been expecting earlier. And with the grape's inherent acidity, this is a nice balanced wine between sugar and acids. 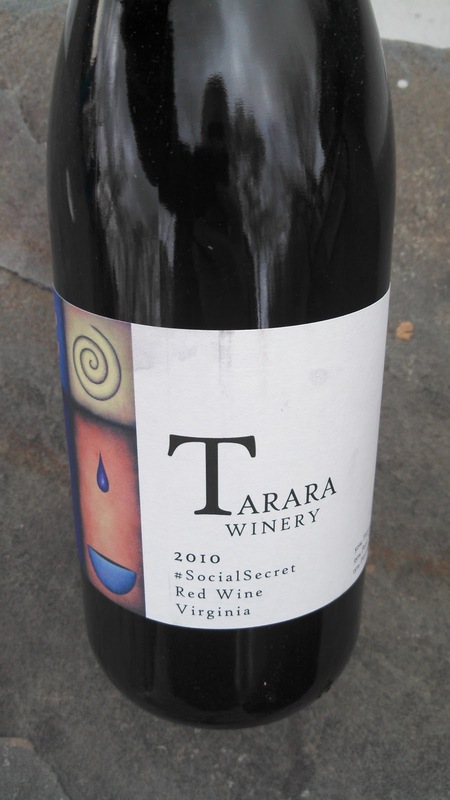 There's much more at Tarara: other vineyard designate wines, the Commonwealth Collection, views of the Potomac and Maryland, and a responsive tasting room staff. We'll be back. Cheers. Since it's currently Cider Week Virginia, I felt it appropriate to discuss the most famous apple variety from the Commonwealth of Virginia - The Albemarle Pippin. This is a versatile apple, suitable for eating, cooking, juicing, and hard cider. The apple's official name is the Newtown Pippin and originated in Long Island from a chance seedling (known as a pippin) sometime in the early 1700s. Col. Thomas Walker of Castle Hill brought the apple to the Piedmont area after serving with Gen. George Washington during the Revolutionary War. It quickly became extremely popular and was grown by Washington and Thomas Jefferson. It became an international sensation in 1838, when "Andrew Stevenson, the American minister to Great Britain, presented Queen Victoria with a gift basket of the apples from his wife's Albemarle County orchard. In response, the British Parliament lifted import duties on the variety...(wiki)". Over time the Albemarle Pippin lost it's appeal; maybe because export markets became more difficult to penetrate or crops dwindled since the apple it is not easy to grow and requires a warm summer and autumn. Plus the apple requires a couple months of storage after harvest in order for it to develop it's unique and complex tart-sweet flavor. This situation is definitely not suitable for distribution in large chains who now prefer the Delicious varieties. In recent times it has only been available in roadside markets, local orchards, or interestingly, from California-based Martinelli's in their sparkling cider. Which leads us to hard cider - where the Albemarle Pippin is favored in both single varietal, sparkling, and blended ciders. The Albemarle Pippin returned to Col. Walker's Castle Hill estate through Castle Hill Cider where the apple is used in several ciders. Our favorite is the sparkling single varietal Levity - where the apple juice is fermented and aged in clay kvevri containers buried in the ground. The pippen is also blended with other varieties in their Celestial and Terrestrial hard ciders. 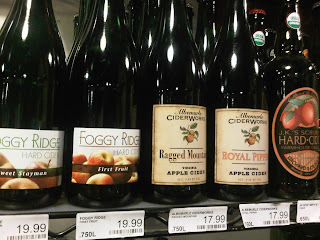 The first modern Virginia cidery, Foggy Ridge Cider, uses the Albemarle Pippin in several new and interesting cider products. These include the sparkling Foggy Ridge Handmade, Pippin Gold (a unique blend of 100% Newtown Pippin hard cider and apple brandy from Laird and Company), and the Pippin Black which combines hard cider from Newtown Pippin and Arkansas Black apples with Virginia apple brandy. Other Virginia cideries have joined in the fun. 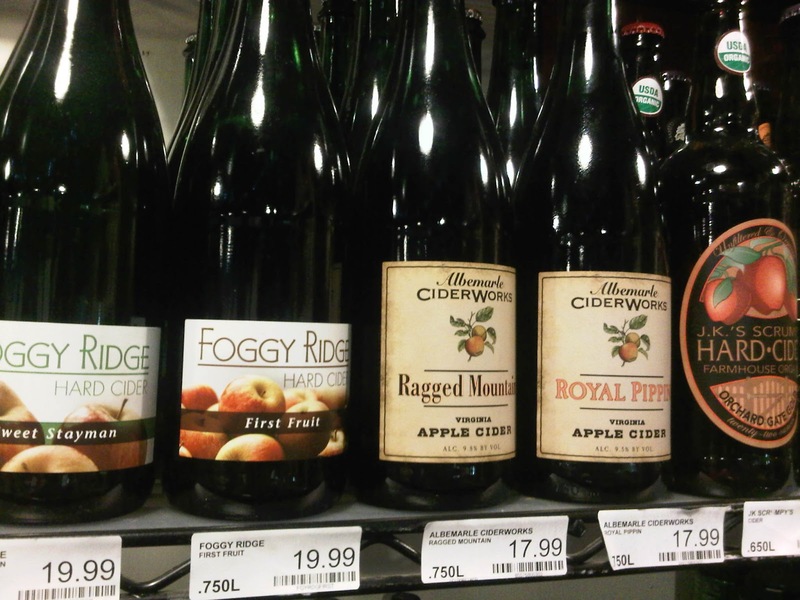 Albemarle CiderWorks produces a couple ciders using the apple - the 100% Royal Pippin and Ragged Mountain. Potter's Craft Cider's flagship cider is a blend of Virginia Winesap and Albemarle Pippin. The latter is also a blend in the Old Hill Cider Yesteryear. And finally, keep in eye out for Blue Bee Cider where the cider master, Courtney Mailey was an apprentice at Albemarle CiderWorks and will be using the Albemarle Pippin when her ciders are available in 2013. Virginia is not the only region to utilize the Newton Pippin; it can also be found at West County Winery & Ciders in Colrain Massachesetts; the large scale production Original Sin Hard Cider; and even in Canada by Sea Cider Farm & Ciderhouse in British Columbia. So head on out and grab yourself a Newton or Albemarle Pippin hard cider. Cheers. It's time again for Regional Wine Week - five days in which consumers, retailers, bloggers, and writers can celebrate the virtues of local wine. DrinkLocalWine wants your stories on how you celebrate or enjoy local wine. Plus, the organization will announce the location and date for their Fifth annual Drink Local Wine Conference. I'm rooting for Maryland Wine - don't want to travel too far. Cheers. DrinkLocalWine will hold its fifth annual Regional Wine Week from Nov. 12 to 16, where wine writers, bloggers and enthusiasts share information about wine from “The Other 47” states (excluding California, Washington and Oregon) -- providing a one-stop shop to see what’s cutting edge in regional wine. The fourth annual regional wine week, held last year in October, was one of the most successful in the group’s history, linking to dozens of stories and blog posts about wine produced in more than half of the other 47 wine states. This year’s bonus -– we’ll announce the site and date for our fifth annual DrinkLocalWine conference and give away two pairs of tickets in the process. Just check the website every day during wine week to find out how to win. Our annual conference, which spotlights regional wine, was held in Denver in 2012, featuring the Colorado wine industry and its cool-climate varieties like Riesling, Gewürztraminer and Cabernet Franc. Previously, the conference has been held in Missouri, Virginia and Texas. During wine week, writers from across the United States are asked to post stories to their blogs, Web sites, magazines, and newspapers about their favorite regional and local wines, wineries and events. Then, send us a link to the post, and our website will aggregate the stories, providing a snapshot of regional wine. Over the past four years, writers from across the country have covered dozens of states’ wine industries. Regional Wine Week is open to anyone –- from professional wine writers to wine enthusiasts with Facebook pages or Tumblr sites. You can submit stories about anything related to wineries, winemakers and wines from the Other 47 states. For information about Regional Wine Week or to submit a story link, call (469) 554-9463 or email us. Did you know that there is now nine cideries operating in the Commonwealth of Virginia? Until very recently, I thought there was only three; but it appears cider making is growing as rapidly as wine and beer. 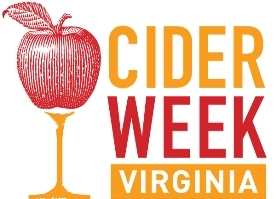 Now the industry has its own week, Cider Week Virginia, starting Friday November 9th through Sunday November 18th. 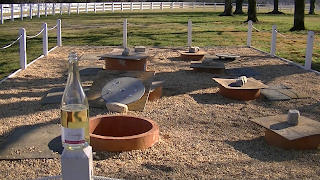 During this period you can celebrate the historic tradition of Virginia cider making, learn about unique apple varieties such as the Albemarle Pippin or Graniwinkle, and most importantly, sample some excellent hard cider. Most of the events occur in Charlottesville and Richmond, but there are a few hosted in other regions. For Washington D.C. readers, there are two events in our area, the first, a Cider Dinner at Birch & Barley on the 12th and the second, a tasting at Norm's Beer & Wine on the 17th. But check out the events page for all options. Here is a list of Virginia Cideries and check out our videos featuring Foggy Ridge Cider and Castle Hill Cider. 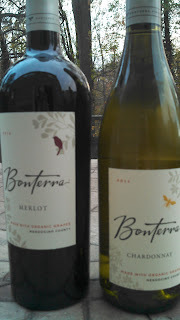 Last night was another #TGTaste with Leslie Sbrocco featuring wines from Bonterra Vineyards, a California winery located in Mendocino County - just north of Sonoma. Specifically we sampled their 2011 Mendocino County Chardonnay and 2010 Mendocino County Merlot, both produced from certified organically grown grapes. Organic and Biodynamic® farming seems to be the culture in the county as a large percentage of vineyard practice those techniques or philosophies - 25% says wiki. Apparently, according to Bonterra, this "goes back to the history..young people moving here in the 60s to get back to the land". And nice farm land they found. I also learned that the Russian River originates in Mendocino so in reality the Russian River valley is not inclusive to Sonoma - well maybe the AVA - but not the nutrients in the soil. The Chardonnay grapes were harvested along the river in the Sanel Valley whereas the Merlot grapes were grown in the warmer McNab ranch in Hopland. We started with the Chardonnay ($14) which was produced using a combination of oak and stainless steel. 70% of the juice was fermented in a combination of French and American oak - also undergoing malolactic fermentation - whereas the remaining 30% was fermented in stainless steel. The wine was then aged in a different combination of neutral and new oak barrels. The result is a very good - I mean VERY GOOD - wine. The non-Chardonnay drinkers in our immediate group loved it as it started with a vibrant green apple flavor, followed by a creamy vanilla mid, ending in a balanced acidic-lemon finish. The bottle was empty rather quickly as we all enjoyed this one. Going to look to restock today. Moving to the Merlot ($16), each lot was fermented separately and then blended together with small amounts of Petite Sirah, Syrah, and Carignane. 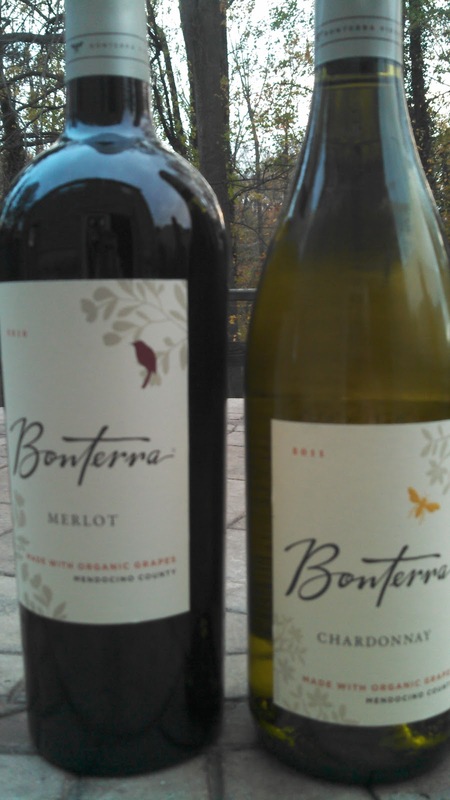 Ms. Sbrocco informed me that the addition of these three grapes added "complexity and spicy notes" to the final product. This wine was also a big hit with the #TGTaste community, as @MyVineSpot tweeted "Delightfully approachable w/ aromas/flavors of dk cherry, raspberry, spice accents & cedar". But we had to wait awhile to allow the wine to breathe - the initial taste was quite mundane. However, after decanting the dark cherry flavors sprang forth, followed by some spice, and a very smooth, soft finish. Another lesson learned - decant as often as possible. Overall, a very good night. I definitely plan on revisiting these wines (love the QPR) and spend more time researching the wines from Mendocino. Cheers.